Have to Love a Two-fer! 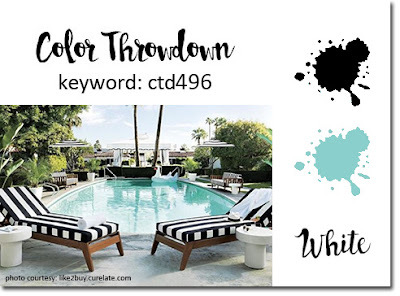 Color Throwdown #496 is one of my favorite color combinations with black, aqua, and white. 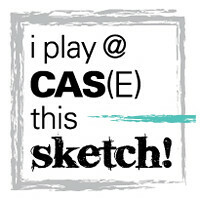 CAS(E) This Sketch #275 is a Retro sketch from CTS#3. I put both of these challenges together, and used on of my current fav stamp sets, Petal Pallette, and also the Sheet Music background stamp. Petal Pallette, Swirly Bird, and Stitched Shapes die sets were also used. WOW! When I type everything I used, it appears that the card would be a hot mess, but I think it is actually pretty clean. I had the basic card in my head, and knew I would turn to Petal Pallette yet again. 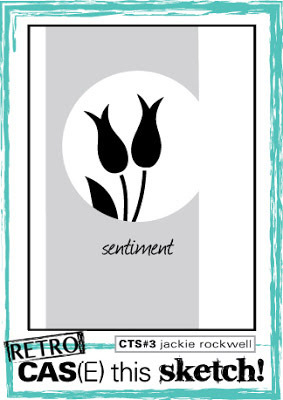 I just love that bird, the sentiments, the label die, all of it. The rest evolved. Pool Party is a soft color, and I wanted that to contrast with the black. The CTS sketch called for a vertical banner on the left, but I wanted something with more movement. Therefore, I turned to Swirly Birds die set. I thought I needed more white space so I ran the die through the Big Shot again and used the white negative space on the left border. I cropped out the Basic Black and Whisper White circles using the Stitched Shapes dies, and also cropped the bird. When I started to layer everything together, I realized the Pool Party base needed something and that’s when I decided to pull out my Sheet Music background stamp. I used Pool Party and stamped it off once for a very subtle background. The bird really needed to stand out, so I Bermuda Bay Stamping Write marker so it would still be aqua, but a deeper shade. Then I decided that the white circle was just too white and blank. I pulled out the leaves stamp from Petal Pallatte, used Pool Party stamped off once for another subtle element. The pieces just need to be put together using dimensionals, Tombow liquid glue, a ribbon, and two Bermuda Bay enamel shapes. I hope you can see the inspiration of the sketch in my card. My circle wasn’t cropped out of the banner, but the inspiration was there. Thank you for visiting my blog. I enjoy reading comments, so please feel free to leave one. Thanks! I love it when a card evolves like this one did. I love the border you’ve created with the Pool Party paper and black lines. Such beautiful texture on this lovely card, Sue! Thank you, Brian! All the pieces on this card evolved and I was pleased with the result. I love this color combination.